It's the perfect place to visit this festive season, we tell you why. 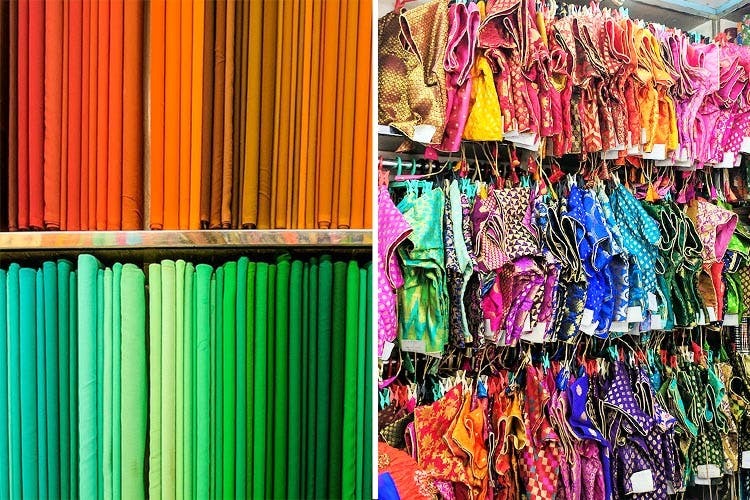 While walking down the streets of Chembur, close to the station, we chanced upon a 40-year-old store that really needed some polish on the outside, but as soon as we got closer, we couldn’t take our eyes away from all the colours that popped out. Shrimati Matching Centre knows how to entice its audience by hanging some of their best blouses right at the entrance to invite you in. As soon as you walk in, you see fabrics in every shade, starting at INR 150 per meter and there’s a separate section for wedding fabric (gorgeous!) that starts at INR 300 per meter. Then, right at the end, you see an entire section of gorgeous readymade blouses of every shade, colour and pattern and you’re finally sure that there is hope when it comes to finding the perfect one. Their blouses start at INR 800 and can go up to INR 5,000, so be prepared to pick and choose the right one for you. While they do have fabric and readymade blouses for us to buy, it would have been nice if they could add latkas and other peripherals to add to the blouses, in case we want them heavier than usual. We recommend you head out there with your lehenga and ask them to find you the perfect shade, or you can even ask them to try and source it for you, to make things easier.